It’s common for parents to assume that toddlers should go to bed a little later than when they were in the infant stage. This is actually completely false. The ideal bedtime for toddlers is between 7pm and 7:30pm. If you’re trying to put your toddler to bed later, that’s where a lot of problems can kick in. Your toddler needs just as much sleep, if not more, due to the rate they grow and develop. If they don’t get enough sleep, they’re going to be over-tired during the day, rather than waking up nice and refreshed. This in turn is going to cause behavioural issues in the daytime, as well as at night. So, stick to an early bedtime and you’ll find a lot of sleep related issues disappear. Once your little one reaches the terrible two phase, naptimes can become a real challenge. They are old enough to realize that while they’re asleep, you’re not and there are all kinds of interesting things that could be happening. They naturally want to be a part of this so they’re going to be less interested in going to sleep. Be prepared for a lot of tantrums as they start to test their boundaries. However, if you persist and stand your ground, naptimes will become less of a struggle and you won’t be left to deal with a very unhappy, over-tired toddler throughout the day! Having a night-time routine is something you were likely told to do when you were suffering from those dreaded sleepless nights when your child was in the infant stage. However, it’s more important than ever to establish a bedtime routine with a toddler. It really helps to put them into a nice, relaxed state, making it much easier for them to fall asleep. Many parents start the routine as early as dinner time. After eating dinner, give your little one a bath, change them into their pyjamas and read stories together. Milk can also help to settle them down during story time. Then, after stories have “cuddle time”, then bed. You can mix up the routine for whatever works best for you. Of course, getting into a routine isn’t easy. They will fight back in the beginning, so it is something you will need to persist with. There will also be days when they refuse to sleep, even though the routine usually works well. Accept that there will be bad days, but never let it deter you from continuing the routine. Often, bedtimes consist of one parent putting the child to bed. It could be you take turns with your partner, or maybe one of you is better at the bedtime routine than the other? Whatever the reason, did you know that in some cases it works much better if both parents are present at bedtime? It’s not something that is widely talked about, but just sitting in the room with your partner after the lights go out can reassure your toddler that everything is fine. It may seem counterproductive. After all, how is your toddler going to settle down if you’re both in the room? Surely it’s going to keep them stimulated and the room should be as quiet as possible? Well, believe it or not, your toddler finds adult conversation boring. As long as you dim the lights and keep your voices low, it settles your little one and encourages them to drift off. They’ll feel safer with both of you in the room with them, so will be less reluctant to drift off. Of course, this isn’t going to work for all toddlers. However, if you’re really struggling, it’s definitely worth a try! One of the most common problems parents have with their toddler is getting them to actually stay in bed. If your little angel likes to get up on their own, how you deal with it will determine how often they do it. For example, if you give them extra attention or give in to another bedtime story, it’s teaching your little one that if they get up, they’ll be rewarded. Instead, lead them back to bed without making a sound if you can. The only exception to this is if your little one starts having nightmares. It is common for toddlers to start having nightmares occasionally that force them up at all hours of the night. There’s also separation anxiety stages that they go through, largely beginning at around 18 months. So expect more issues with them staying in bed at this time. Learning to determine why your toddler is getting out of bed will help you realize how to deal with it. Bribery is one of the most successful tools used in modern parenting. Encouraging good behaviour, it can work surprisingly well at bedtimes too. Star charts are all the rage these days and for good reason – they work! When your toddler gets a certain number of stars, they then receive a reward. Now, in order for this system to work, it helps to give a reward after 3-5 stars. The great thing about the star chart is that you can tailor it to suit your toddler’s behaviour. If they are currently struggling to stay in bed just one night a week for example, giving them a reward after 2 stars could be a good start. One star could be given for getting into bed without a fuss, while another star is given if they stay there all night. In the morning, if they’ve successfully stayed in bed, give them a reward. That way, they’ll see that the star system works and you will stick to your word and give them a treat if they follow the rules. You can start increasing the amount of time before they get the reward as they start getting better at staying in bed. Of course, you should explain the star system to them so they know what they have to do and that they’ll receive a reward if they do it. So if your toddler is waking up because of nightmares, what’s the best way to deal with it? Many parents find that talking about the nightmares helps. That way, you learn what your child is actually afraid of and you can then work on reassuring them. Remind them they are always safe exactly where they are. I had a friend whose toddler was convinced there were monsters going to get him in the night. Sound familiar? It’s one of the most common fear toddlers have. She got around it by telling him that his blanket was magical. As long as he was underneath it, nothing could touch him. Not only did this help to ease the worry about monsters, but it also did a pretty good job at convincing him to stay in bed! Something known as dream rehearsal is also said to be effective. Here, when you talk about the nightmare, you can create an entirely different, happier ending. So, say your little one dreams of falling. You can tell them to imagine that they can fly. This supposedly builds up the subconscious, so when that particular nightmare happens again, the alternative, happier ending will result. If you find it impossible to get your toddler to sleep because they’re too busy crying and having a full-blown tantrum, a checking routine can work. This is where after say, five minutes, you go back into the room, stroke their head reassuringly, remind them it’s time to sleep and then leave the room. It’s very important not to cuddle or go into long negotiating talks with your little one at this point. Go back in after five minutes to check once again. You can start extending the amount of time you leave before checking again too, so they don’t start timing you or relying upon you to go back in. Continue checking until you see your child has fallen asleep. It might seem like a pretty long drawn-out process, but if you have a consistent bedtime routine, you should find sleep issues only last a few weeks’ maximum. Now, we mentioned earlier that it’s important for toddlers not to skip their afternoon naps. However, what’s equally as important is to ensure that they don’t have too many naps. If they sleep too long during the day, they’re going to have a very difficult time sleeping at night. Ideally, stick to naps before 3pm. Obviously this tip applies to those who don’t share their bed with their toddler on a regular basis! If your little one has their own room, don’t let them just climb in with you whenever they feel like it, no matter how tempting it might be. When you’re sleep deprived and desperate for just five more minutes without dealing with a toddler tantrum, it’s tempting to just let them cosy up to you. However, once you’ve done that you might as well accept the fact they are there to stay. If they have a choice to sleep next to you or in their own bed, they’re going to choose you every time. So don’t give them a choice. Always take them back to their own bed so they know it won’t make a difference even if they do climb in with you. Overall, there really is no set tip that will work. Every toddler is different and you may need to tweak the advice above a little. You also may need to try 9 out of the 10 ideas mentioned before you find something that works! It’s all about trial and error and being consistent when you do find a tip that works for you. 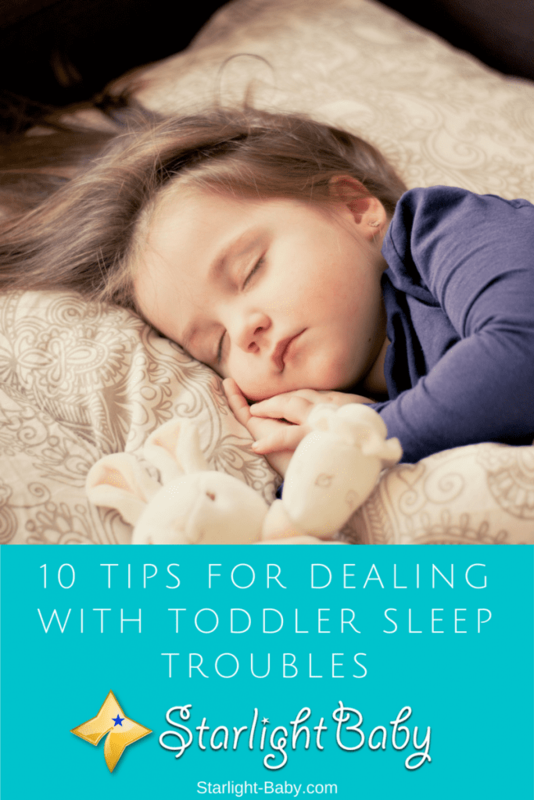 Toddler sleep troubles are no joke, but when handled correctly they are thankfully temporary! I might need to try these tips one by one and see which one can help to let my baby sleep better. I am trying to establish a better daily rhythm, including nighttime routine, but when my baby grows older a bit (he is one year old now), he doesn’t seem to need as much sleep as before, and he doesn’t fall asleep early too. So, I’ll need to revise the routine. 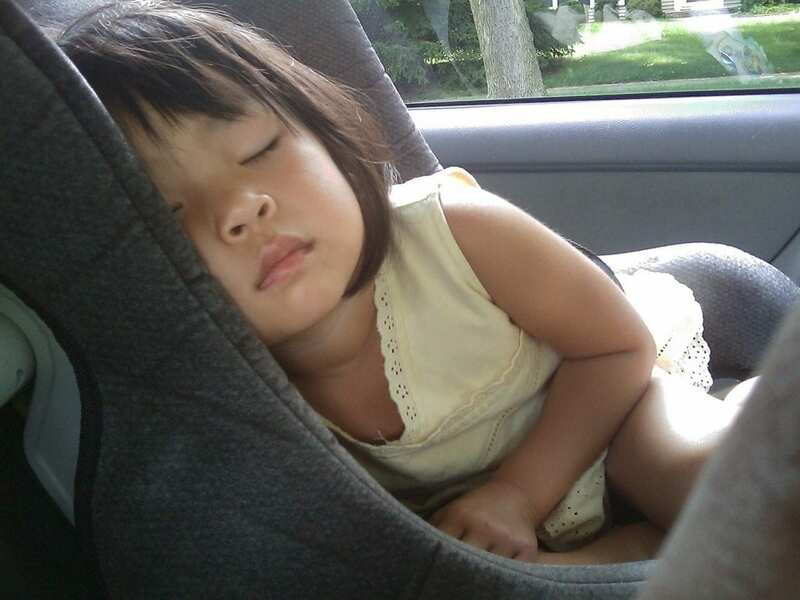 Kids’ sleeping is always an issue to me, but I am glad that I don’t really need to worry about my older children’s sleep now as they can take care of themselves. So I think I might just need to wait for one or two years until my youngest can also sleep well on his own, then I can enjoy my good sleep. Sometimes kids have a hard time sleeping when they feel excited or when they are looking forward to some activities the next day. That is what I observed with my daughter. She usually is very eager to face morning again because we often tell her ahead of time what she will do the next day and her routines. Because kids are so imaginative and creative, they tend to always ask what they are going to wear, where they will go and who they are going with. That is why when we have some important activities the next day, we will not inform her so she can do her usual night routines before going to bed. I can relate with the first tip of making the baby go to bed early instead of having to do it late. While I was a kid, mom made it a point of duty that I always sleep early and that contributed to how I even plan my sleeping schedule at this stage of my life. Nightmares are serious issue that affects toddlers sleep, if it’s not managed well it’s going to have a huge devastating impact on their sleeping pattern. I have come to realize that most toddlers are scared of their closets and afraid of the dark, which is why once they have a nightmare and wake up seeing the dark, their fears intensifies and this doesn’t bode well with their ability to sleep well.